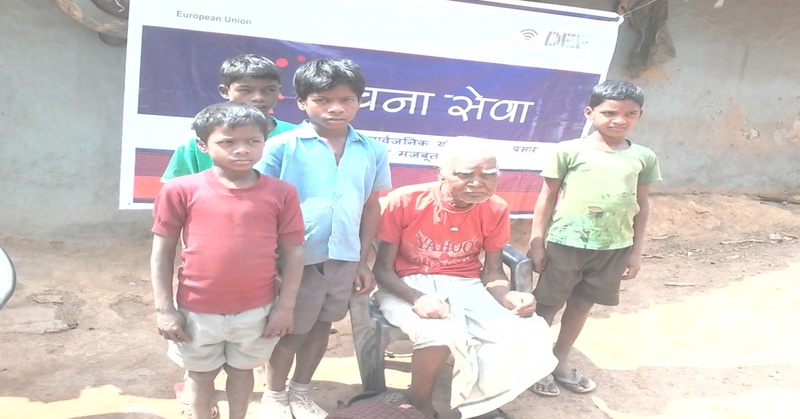 soochnaseva | Old Cherga Oraon receives money through Vridha Pension, thanks to Soochna Seva. Cherga Oraon is blessed with four daughters and by god’s grace all of them are well settled with their own families. It has been four years since he last visited his daughter’s house. The Soochna Seva team met him during a meeting in Itki block of Ranchi and came face to face with his situation. He is a 67- years-old farmer and during his early days he also used to sell woods for his livelihood. As time went, by he stopped working and depended entirely on his three sons. He stayed in their house for food and shelter but never received money for his other requirements. The team informed him that by availing Vridha Pension Scheme he could have money for himself and he will be able to meet his daughters. Since, Cherga did not have a bank account therefore the team suggested him to make one so that the pension would go directly to his account. Cherga is from Dola Chinarpurio village which is 16 kilometers away from Itki block and due to old age and lack of transportation facility in the village, it was difficult for him to travel such a long distance. That is why the team decided to help him and hence collected his Aadhar card, voter ID card and photographs and opened his bank account under Pradhanmantri Jan Dhan Yojna.